It has been a defining few months for Peter Pilotto and Christopher De Vos who, in addition to launching a sell-out capsule collection with Target and Net-a-Porter this month, were also named BFC/Vogue Designer Fashion Fund winner. Along with bespoke mentoring, the honour includes a £200,000 grant that will surely allow the pair a tropical holiday after today's effort. Under the hyper-hued fluorescent lighting of their latest Bureau Betak set, housed in an retro conference centre, the design duo worked out a whole new knitwear equation. 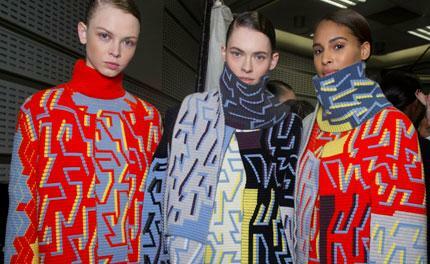 Moving well outside of their print remit, they unleashed ribbed intarsia knits in clashing geometric formations and primary colours, followed by zippered knit coats with graphic spiderweb patterns in saturated shades of scarlet, sulphur and cornflower. Fur was also inserted into muffler roll necks and along the arms of their opening looks, creating powerful, superhuman forms. Bugle beaded coats and woollen shifts dressed with mother of pearl shell embroidery revealed a new level of fabric exploration. Printed puffer bombers and an array of panelled pattern dresses, updated with webbed sports belts, were familiar and on form. Yet, it was clearly their layered knitwear looks that snagged a home run.